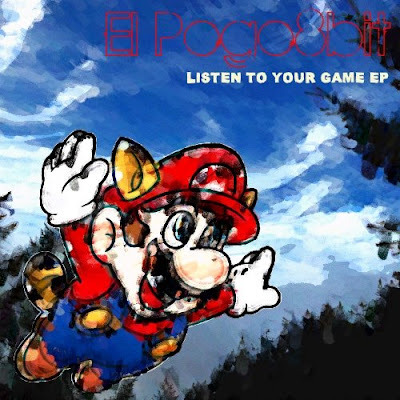 I was lucky enough to get an email from Mexico based musician El Pogo8bit and being informed about this artists debut, Listen To You Game EP. The album available for free download at El Pogo8bit's myspace page and I highly suggest you check it out. I've been bumping this thing on repeat since I first listened to it. The album even includes guest musicians like Electro Dreams and personal favorite, ThePlasmas. This VGRock album really is all over the map in the best way possible. Kicking off with a dirty guitar driven rendition of TMNT called Outdoor Sewers, followed by some glitchier guitar rock in In Da Cave, a cover of Zelda 2's cave music. From there we go to Spining Bird's Qi, a more traditional sounding cover of the music from Chun Li's stage in SF2, which is a stand out track for me. Taking that laid back vibe a little further we end up at a relaxed samba mix of the intro theme from the original Pokemon games called Red or Blue. The Man on The Silver Board is a collaboration with Electro Dreams, together making for some upbeat chiptune rock dedicated to Silver Surfer. This leads to another collaboration, this time with ThePlasmas covering one of my favorite video game soundtracks ever, Little Nemo with the song Mushroom 4 Candy. The album finally comes to a close with That Surfin' Rat! which is another guitar track, this time dedicated to the music from Mappy! The album is fairly short, but the gritty straightforward way El Pogo8bit tackles his guitar work on these songs is definitely interesting when juxtaposed with some of the other instruments and styles he includes, and will keep you coming back just to hear them again! The Listen To Your Game EP was a great surprise for me and I am glad to have been informed about it. I am definitely looking forward to more from El Pogo8bit in the future!